Cllr. Parvez Ahmed is the immediate past Mayor of the London Borough of Brent. 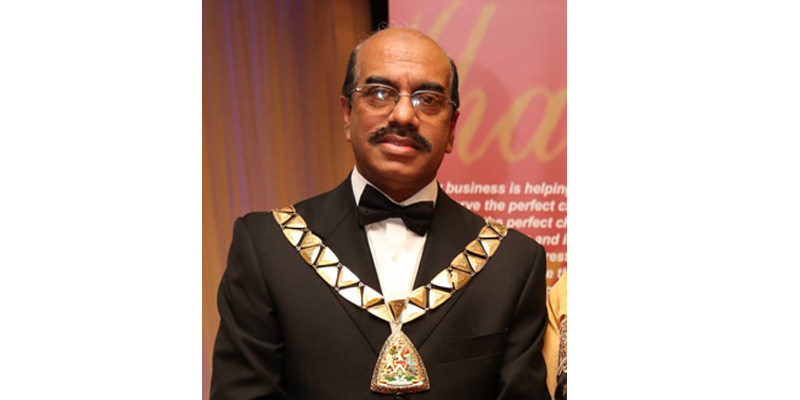 He was the first person of Bangladeshi origin to be elected as Mayor of Brent. He is also a Councillor in Dollis Hill in the London Borough of Brent, having been elected in 2014. A successful Businessman and community activist, in 2016, Cllr Ahmed was recognised for his outstanding contribution to politics and the local community by being presented the British BangladeshiWho’s Who Outstanding Achievement award. In 2017, during his Mayoral year, the Canary Wharf Group PLC, commemorated Cllr Ahmed’s excellent contribution to civic duties. Prior to this, in 2006, Cllr Ahmed received a community achievement award from Channel S in recognition for many years of hard work in the community. He completed his education in Bangladesh before moving to the UK. Since the age of twenty one, Cllr Ahmed established a number of businesses throughout Bangladesh, most notably having invested in the textiles and garment industry. He continued his focus in the textiles and garment industry after arriving in the UK where he also opened a restaurant. He has been closely involved with theBangladesh Caterers Association where he has served as a Management Committee Member, Deputy Secretary General and Secretary General over the past twenty eightyears. Cllr Ahmed is also the Chairman of New Generation 2000, and was formerly a Directorat the North West London Chamber of Commerce. Cllr Ahmed also helped organise theinaugural education awards ceremony for the Bangladesh High Commission celebrating the achievement of young British Bangladeshis, which is now a celebrated annual event. Cllr Ahmed is an active member of the Labour party. Over a number of years, He has been involved with many local and national organisations holding a range of posts including Board Member, Management CommitteeMember, Trustee and Chairman. These groups include the Tricycle Theatre and Cinema, Brent Safer Neighbourhood Team, Brent Minority and Ethnic Forum, Greater Sylhet CouncilUK, North West London Muslim Forum, Kilburn Partnership, Single Regeneration Board, Friends of Bangladesh UK, West Hampstead Bengali Association, 403 Harrow Road Limited,Bangladesh Centre (Notting Hill, London), Brent Bengali Community Centre and the Sylhet Sador Education Trust. He is also an advisor for the Bangla Post UK Newspaper and a LifeMember of the London Bangla Press Club. Cllr Ahmed has supported numerous mainstream national charitiesthrough donations and regular fundraising. During his Mayoral year in 2016/17, his charity appeal was in aid of his chosen charities, Community Action on Dementia Brent, Brent Centre for Young People and Sufra North West London. He raised thousands of pounds and raised significant awareness for some very worthy causes. In Bangladesh, hehas a charity namedafter himself (Parvez Ahmed Female Educational Trust) to encourage women to continue studying, in addition to supporting the APEX International and the Red Crescent project. Furthermore, he is a Life Member of National Heart Foundation Hospital (Sylhet),Beanibazar Cancer Hospital, Red Crescent Bangladesh, IQra Academy Sylhet, JalalabadDisabled Rehabilitation Centre and Hospital and Balangonj College. Married for 32 years to former London Borough of Brent Councillor Lena Ahmed, the couple have been blessed with two sons. His elder son, married with a daughter, has a Masters inBiomedical research and worksin the Civil Service, whilst his younger son, has a Law Degree, and works in Local Government.